I went to the Rose Bowl on Sunday and purchased a small bag of Sea Glass for a quarter (25 cents). I thought it would be great inspiration for a color palette at some point. Well, of course every new inspiration will always lead you to people and places that have already considered the beauty of sea glass. 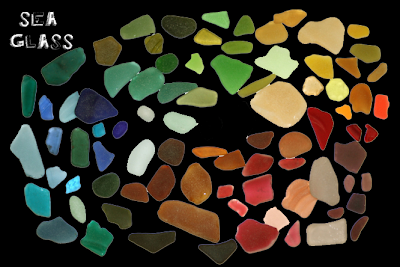 Actually, the gay (as in happy) little houses at the bottom have nothing to do with Sea Glass other than the fact that they seem to be the perfect place to store your collection if you happened to be a collector of these colorful treasures. Or they could also be a great place to store your My Little Pony collection. You have one right? Labels: color theory, Conceptual, What?